Hung Bunny / Roman Dog Bird cassette release from theMelvins.net & Small Doses! I'm really excited to announce a new Melvins cassette that I'm releasing along with my friend Joe's record label Small Doses! On February 8, 2003, Melvins performed live to accompany Cameron Jamie's Super 8 Film BB at the Walker Art Center in Minneapolis. They performed the score twice, each time offering a unique take on the songs Hung Bunny and Roman Dog Bird from the legendary Lysol record. Both performances are featured on this release. The audio was mastered for cassette by James Plotkin and the tapes were professionally duplicated onto the highest quality chrome plus tape. The music sounds amazing and massive. The cassettes are packaged in a custom, letterpress printed, die cut box made by Stumptown Printers in Portland, Oregon. There are 15 different cassette shell colors dispersed in the run. 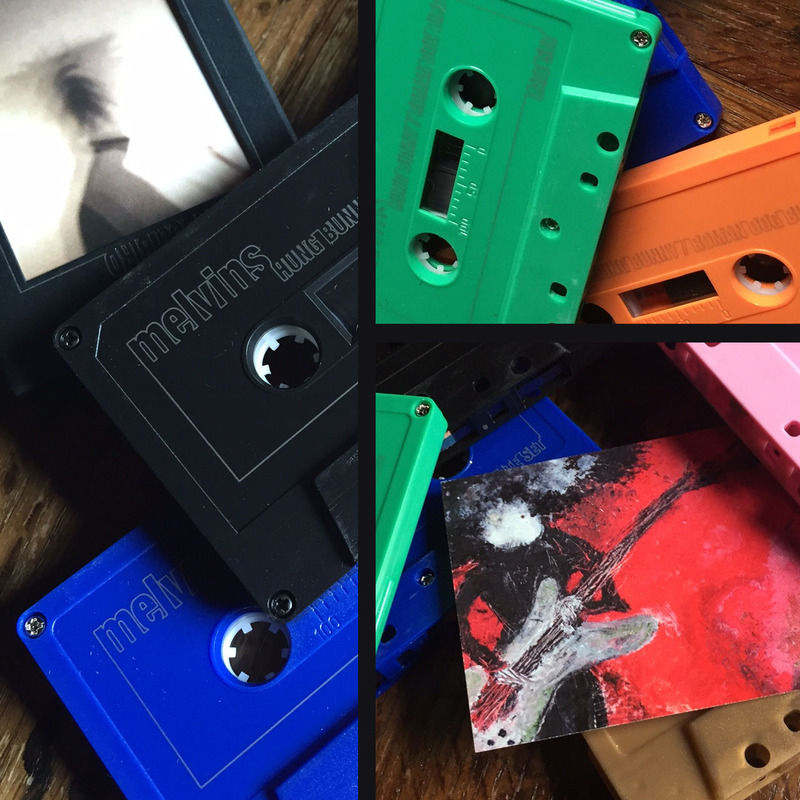 Each of the 500 tapes features a unique cover image – no two are alike! The Melvins' Hung Bunny/Roman Dog Bird cassette will make its debut at the Prick release party on August 11, 2016 at Grumpy's in Minneapolis. Melvins will have them on subsequent tour dates as well. The majority of the run will be sold in the shop at small-doses.com. UPDATE: The online sale begins on Sunday August 21st at Noon/12PM Central time. This is a special release that I've been thinking about doing for a while now and came to fruition over the past few months after pulling the plan together and receiving the Melvins blessing. 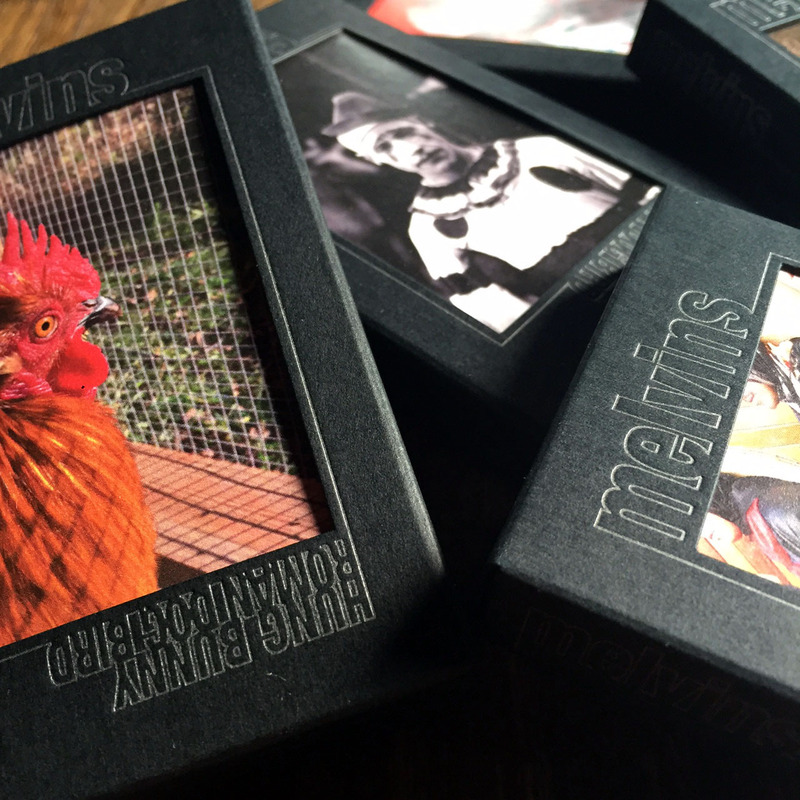 Aside from it being a great recording of a unique piece of music by the band, it also is a sort of personal celebration around the years of working on this site and the desire to put something like this out and share it with the people that have visited themelvins.net over the years, contributed to the wiki, and come together on the forum.